Florida was the central networking base and staging area for the “false flag” terror attacks of 9/11. Fifteen of the nineteen Arabs allegedly involved in the hijackings, for example, lived and had their base of operations in South Florida. “False flag” means a crime which is designed to be blamed on others in order to achieve a strategic and political goal for the real perpetrator of the crime. To understand how this tactic is used in false flag terror operations I recommend reading The Little Drummer Girl by John Le Carré and watching the movie by George Roy Hill. Victor Ostrovsky’s books about the Mossad are also recommended reading. The Little Drummer Girl was written with input and advice from many Mossadniks, including a former head of Israeli military intelligence. Much of the book deals with the way Mossad creates a completely false history for a Palestinian “terrorist” by leaving a trail of traces across Europe. A false history is exactly what was created in Florida, albeit on a much larger scale, with the 15 Arabs “hijackers” whose identities were used to create a false history prior to the attacks of 9/11. There are, however, obvious flaws in this history, which will be taken up later. That a false history was being laid was quite clear from published reports: “At least six of the suspected terrorists had two sets of driver’s licenses issued by Florida, which would have allowed two or more people to use the same identity,” the Sun-Sentinel (Florida) reported on September 28, 2001. “Many of the suspected terrorists, it is becoming increasingly clear, swapped identities as part of their preparations for the Sept. 11 attacks on the World Trade Center and the Pentagon, according to a Sun-Sentinel review of documents, interviews and published reports.” But why, and by whom, were the “hijackers” identities being swapped? Were these Arab suspects even aware that their identities were being used by others? So who was really running the terrorist network in Florida that resembled a Soviet intelligence operation? A preponderance of evidence indicates that Israeli military intelligence was the master organization behind the “Arab” terrorist network based in Florida. My discovery that Israel’s prime minister, Ehud Olmert, made a secret visit to New York City on the eve of 9/11 led to more discoveries about the Israeli intelligence network in Florida and its role in the terror attacks. I have experienced several remarkable coincidences related to the events of 9/11. The first was my wife’s vivid dream about our family being attacked by airplanes, which she experienced a few days before the actual aerial attacks occurred. What is most remarkable about this coincidence is that Helje related her dream to me as we drove through New York City in the early morning hours of September 11, 2001, about 7 hours before the first plane struck the North Tower. Another remarkable coincidence happened during a trip to Miami in February 2006. We had flown in from Germany and were staying at the Monaco Hotel on Collins Avenue. 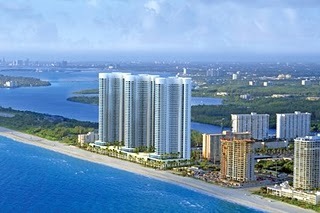 The Monaco is in a part of North Miami Beach that is now called Sunny Isles Beach. We had arrived at night and simply driven north on A1A until we found a suitable hotel. The Monaco Hotel is one of the few old fashioned low-level hotels that remain in that area. The surrounding buildings are monstrous 55-story skyscrapers built right on the beach, the tallest oceanfront condominium towers in the United States. These would be the Trump Palace, the Trump Royale, the Trump Grande Ocean Resort and the Trump International Sonesta Beach Resort in Sunny Isles. At the time, these awful skyscrapers were still under construction and the fences around the site were plastered with frightful posters of the developers, or “the visionaries” of Sunny Isles Beach: Donald Trump and his Israeli partners, Michael and Gil Dezer. Donald Trump, center, is the frontman for the Israelis, Michael and Gil Dezer. We went for a walk along Collins Avenue the next evening and stopped in a large beach store called “Wings” about a block north of our hotel, looking for a bathing suit for my daughter. The logo for the store reminded me of the “wings” an Israeli pilot wears on his chest. My wife noticed that the screen saver on the computer behind the counter was an Israeli flag that covered the entire screen. While my family browsed around the store, in which we were the only shoppers, I talked to the young Middle Eastern looking man behind the counter. I recall asking him in Hebrew if he was from Israel, which he was, and then asked him if the store was Israeli-owned. That turned out also to be the case. As we turned to leave I remember saying to my family that these were the people who had pulled off 9/11. This was my gut feeling. This was my intuition speaking and it must have been based on what I had noticed in and around the store. I felt very strongly about this. Having visited Florida, California, and the Caribbean I have seen all kinds of surf and beach stores but this store was something else. The Wings store at 17700 Collins Avenue is a very large free-standing building with a high ceiling and a huge windowless space behind the store. There were two trucks parked in the store’s parking lot on the side of the building. The huge windowless warehouse space behind the store seemed way out of proportion for a simple beach store. How much space is required to store bikinis, Tee-shirts, and sun tan lotion? Most beach stores get by with very little storage space — but not Wings. Every time we walked by the huge Wings beach store we never saw any customers; the store was empty. This seemed suspicious because they must have very high overhead costs. Nothing about this store made sense. It seemed more like a logistics base that operated a beachwear store as a front, not unlike the shuttered Urban Moving Systems (UMS) outfit I had visited in Weehawken, New Jersey. UMS was the fake moving company, across the river from the World Trade Center, that was exposed as an Israeli intelligence (Mossad) front. The five dancing Israelis who were arrested on 9/11 after being observed photographing and celebrating the destruction of the World Trade Center, worked for that Mossad operation. Dominic Suter, the head of UMS, was allowed to flee the United States shortly after 9/11 although he was considered a terror suspect by the F.B.I. Apart from the young man working inside the Wings store there always seemed to be an Israeli man of military age coming or going near the store. This seemed very strange for a beach store in a quiet part of town. Most beach stores in Miami are small boutiques run by women or retired people. The staff is always female. Young military age men from Israel are the last people one would expect to find running a bikini boutique in Miami. It turns out that Wings has a whole chain of stores in Florida and up the East Coast, as well as in Texas and on the West Coast. What is most interesting about my experience at Wings is that this chain of beach stores is owned by the two Israeli men that met with Ehud Olmert in New York City on the eve of 9/11 on September 10, 2001. The founders of L&L Wings are Shaul and Meir Levy, two Israeli Jews of Syrian origin. Three years ago, Betar was sold to a four-man consortium (US businessmen Meir and Shaul Levy, local businessman Meir Finegel, and Jerusalem real estate agent Sasson Shem Tov, who pulled out a few weeks ago), following a meeting in New York with then-mayor Ehud Olmert on September 10, 2001. There were no other potential buyers. The day before 9/11, the men that own the L&L Wings chain of beach stores met with Ehud Olmert, then mayor of Jerusalem, in New York City. Other than what I have written, this significant fact has not been reported or discussed in the media, mainstream or alternative. According to the website of Wings, the company’s corporate office and warehouse is on the second floor at 2800 NW 125th Street in Miami, where Shaul Levy is the registered agent. What’s interesting about this address, very near the Opa-Laca Airport, is that it is also the location of a company called Empire Art Products, Inc.
Why would a multi-millionaire Israeli businessman, who owns spacious properties on both coasts of Florida, New York, Texas, and California, share a low-rent building in an industrial park with a company that deals in art products? Is Shaul Levy involved in selling art products? Was he the source of the paintings that were being sold by the Israeli intelligence agents who were posing as art students as they tried to penetrate U.S. government offices from 1999 to 2001? To understand how the 9/11 false flag operation was set up requires an understanding of the extensive network of Israeli companies in the United States and how Israeli military intelligence sets up companies disguised as Arab-owned companies. The two men that Ehud Olmert met in New York City on September 10, 2001 are connected to an Israeli network that ran such a false front company in the Fort Lauderdale area of Florida during the years prior to 9/11. Is this the real reason why Olmert’s pre-9/11 visit to New York has been kept secret?When I discovered that Ehud Olmert made a secret visit to New York City on the eve of the 9/11 terror atrocity, I suspected that his visit was connected with the false flag attacks. Why else would the visit of the well known mayor of Jerusalem to his “sister city” have been kept secret? Visits by high-level Israeli politicians are usually front page news in New York. If Olmert’s visit to New York City was innocent and only involved the transfer of an Israeli soccer club, why has it been kept so secret? Why did Rudy Giuliani and the New York Police Department conspire to keep it secret? It is impossible that the authorities in New York did not know that Ehud Olmert, Israel’s deputy prime minister at the time, was in their city. Mayor Olmert’s visit was certainly no secret to the city or federal authorities – or high-level Zionists of New York City. Why has the controlled media kept it secret? Olmert, who was raised in the Betar militia in a founding family of the Irgun (the Zionist terror group of the 1930s and 40s which later became the Likud party), became the prime minister of Israel after Ariel Sharon fell (or was thrown) into a coma. The secrecy surrounding Olmert’s pre-9/11 visit suggests that it has something sinister to do with the terror events which befell the city the following day. With so much evidence of Israeli prior knowledge and involvement in 9/11, Olmert’s secret visit raises obvious questions: Were the so-called “U.S. businessmen” that Olmert met in New York, the Sephardic Jewish Israelis Meir and Shaul Levy, part of the Zionist network behind the false flag terror attacks of 9/11? Are they connected to the network of Israeli agents who posed as art students? From a tip that I received, I found that Shaul and Meir Levy are connected to an extensive Israeli network in Florida (and across the U.S.) that included a suspicious art graphics business that disguised itself as an Arab-owned company. Mossad operations in the United States are usually carried out in the guise of a legitimate business, such as Urban Moving Systems of Weehawken, New Jersey. An Israeli-owned firm will only disguise itself as an Arab-owned company when it is playing a part in a false-flag operation, like 9/11. The purpose of the Arab disguise is to put up a false front to hide the real people involved in the operation. This is, for example, exactly the kind of disguise that was used by Ptech, the Massachusetts-based enterprise software company that loaded Israeli-written spy and control software onto the most sensitive computer networks in the U.S. government. Something has been bothering me for some years. I feel it may be insignificant, but the event is so out of place, that I had to share it with someone like you who investigates 9/11 earnestly. My wife and I run a small gift shop selling seashells, t-shirts, and Florida gifts. I print my own Florida t-shirts using heat transfers, which I buy from a company called Next Graphics in Fort Lauderdale. One day just before September 11, 2001, I went to their plant to get some transfers. Normally there is a secretary sitting in her cubicle, and she calls to a salesman who takes my order. This time it was different, there was no secretary and nobody in attendance, so I went along the corridor to my left towards the end where I knew there was a large conference room, something like you would use for presentations, and just before entering the room I was accosted by an Israeli (I knew by accent) who started to ask me about my business and expressed an interest in buying it. It was obvious that he was trying to engage me in conversation so I would not go into the room. I ignored him and went straight in. I saw about 10-12 Israelis sitting around this very large conference table. I engaged some of them in conversation, because some spoke Russian, the language I speak fluently. We spoke about the business, but I soon discovered that they knew nothing about graphics. It is only after 9/11 that I put two and two together and realized the significance of the Israelis being there: Next Graphics is owned by a Palestinian family, which recently purchased their building in a high-profile industrial area. After receiving this interesting tip, I looked into Next Graphics and found that it was not truly Palestinian or Arab-owned at all. While the company was registered under the names of Nabil and Nidal Alif, the “principal” person behind the company was actually a Sephardic (Spanish or Arabic Jew) Israeli named Samuel Anidjar. The Anidjar name originated with a Jewish family in Moorish Spain that was expelled in 1492 to Morocco. Israelis and Palestinians do not usually set up companies together. Many Sephardic Jews came to the New World, particularly the West Indies and South America. They were often involved in the slave trade and owned many slaves. Samuel Anidjar and Nabil Alif are partners in several business ventures, such as Easy Trans Ent., Inc.
Samuel Anidjar is a merchandising consultant for The Big Apple and the principal of Next Graphics, Inc., based in Fort Lauderdale, Fla. The firm specializes in the design, manufacture and sales of high-tech transfers used in the garment industry. Mr. Anidjar is also an owner of Next Authentic, Inc., an upscale fashion boutique in the Art Deco district of Miami’s South Beach. He recently completed a remodeling and expansion of the location to accommodate its continued growth. A graduate of College Technique in Deromans, France, Mr. Anidjar moved to the United States with his family in 1972. After settling in Wildwood, N.J., he developed and operated a chain of beachwear stores. After several successful years in operation, Mr. Anidjar selected partners to operate the seasonal shops and relocated to Florida. He continued in the retail business with five new beachwear and souvenir stores, which he sold after a decade of profitability. Mr. Anidjar also owns several commercial properties along the eastern coast of Florida, which he leases to well-established proprietors. His tenants include franchises of Häagen-Däzs and Edy’s Gourmet Ice Cream; and Mezzaluna, a popular restaurant and bar on Ocean Drive in Miami Beach. Dror Levy (age 28) is Vice President of Research and Development for The Big Apple. Currently, Mr. Levy provides consulting services to sportswear manufacturers in the South Florida area. He offers comprehensive solutions and creative recommendations for apparel design, logo and image development, manufacturing, fiscal planning, personnel and distribution. For several years, Mr. Levy also operated La Flame Fashion, Inc., a Hollywood, Fla.-based firm he joined in partnership. His knowledge and application of computer systems integration, financial and operational strategies, marketing and staff retraining brought considerable increases in production, revenues and profits. Mr. Levy is the principal of Dror Inventions, Inc. He holds United States and Canadian patents for a revolutionary automobile cupholder; the device can be fitted to any vehicle, supports most beverage containers, and eliminates spillage during adverse driving conditions. As a result of his invention, Mr. Levy has been selected as a member of Who’s Who of American Inventors and International Who’s Who of Entrepreneurs. He was nominated as Inventor of the Year for 1997 by Intellectual Property Owners, a non-profit association founded in 1972. Its membership includes Fortune 500 companies, small businesses, universities, attorneys, independent inventors and others who own patents, trademarks, copyrights and trade secrets. Mr. Levy is also an active member of the Israel Economic Development Council, a professional association committed to enhancing international trade and commerce between Florida and Israel. Mr. Levy is a graduate of the Amal Institute of Engineering in Tel Aviv, Israel. Immediately following the completion of his formal education, he served four years in the Israeli armed forces as a computer systems analyst and researcher. His responsibilities included computer-aided design (CAD) for defense equipment and supplies, and cost and feasibility studies for various military operations. Mr. Levy also developed and conducted extensive studies on human behavior; specifically, methods of improving soldier morale, motivation and performance during combat. Anidjar’s partner at the Big Apple (a New York City theme park which does not seem to have materialized), Dror Levy, has long been a business partner with Shaul and Meir Levy, the Israeli Jews of Syrian origin who met with Ehud Olmert in New York City on the eve of 9/11. Dror Levy and another Israeli, Eliezer Tabib, are the registered heads of several companies that were started by Shaul and Meir Levy, the 1000 Highway 98 East company, for example, which is also the address of the Wings store in Destin, Florida. Dror Levy was described as “vice president and marketing director for Miami-based Marco Destin Inc., parent of Wings” in the Mobile Register (AL) and Naples Daily News (FL) of January 7, 2004. Marco apparently stands for Marco Island where the company also owns property. “Marco Destin Inc. is led by Eliezer ‘Eli’ Tabib, who took over Wings in Florida and on the Gulf Coast when the L&L Wings partnership was amended in 1998. Marco Destin has 23 stores, including 10 in the Panhandle,” the Naples Daily News reported. I am puzzled by the behaviour of these people. If you entered Graphics waiting room, they had a small altar on your left with and elaborate “kursi” an Islamic prayer on the wall, and several very beautiful Islamic inscriptions, small table with a gold trimmed Holy Quran on it, and several other Islamic mementos. I know that they bought this warehouse around 1999, when they moved from another Lauderdale location at 5600 NW 12th Ave., 33309. Their last location was 2131 Blount Road. You mention that you would like to know how far their location was from the phony hijackers. You will find that it is not that far. “Atta” lived in one of those two story motel type buildings in Fort Lauderdale, near the beach, there are hundreds of such structures near the water there. The distance would be about 1.5 to 2 miles at most, and the Delray location would be about 4 to 5 miles. Interestingly, at that time there was a mosque in an industrial park near FAU, that was operated by a fellow called Ibrahim Bedali, very nice guy, ocean geologist by profession; many of us attended the place, he also taught martial arts, but we never saw a single one of these “hijackers” there. Maybe they attended a synagogue, instead! Why was Anidjar running the false front Next Graphics business in the Fort Lauderdale area in the years prior to 9/11? Is this business or the people involved in it connected with the fake Israeli art students who infested U.S. government offices from 1999-2001? Was it a base of operations to monitor the Arab patsies who were being cultivated to be the suspects of 9/11? Why were these Israeli art students, many of whom had backgrounds in Israeli military intelligence and bomb and demolition units, targeting Drug Enforcement Agency offices? Was this elaborate false front part of the operation controlling and monitoring the 9/11 suspects? Was this an intelligence operation to infiltrate the D.E.A. in order to protect a massive Israeli drug-running operation? Was this part of the Israeli intelligence 9/11 “Arabesque,” which happens to be the name of another of the “Nabil Alif” fake front operation at the 2131 Blount Road location, along with the immediately adjacent stores Next U.S.A. and Next Factoring? Nabil and Nidal Alif are certainly a couple of very busy and enterprising Arabs! How did Shual (or Shaul) and Meir Levy become multi-millionaires in the first place by selling beach towels and bathing suits? Is there another business reason they own so many “free-standing” warehouses along the coast of the United States? Have their beach-side business locations been used by Israeli intelligence as logistic bases for drug smuggling and 9/11 operations? Why was Ehud Olmert really meeting these men in New York City on the day before 9/11 and why has this visit by a senior Israeli politician been ignored by the media?